It’s not often that a promoted club immediately wins the title at the highest level the next season. Still, looking all over the world, it happened 120 times until now. In Chile, Union San Felipe is the only club who did so. Winning the second division in 1970, and claiming the Chilean title in 1971, just ahead of the big guns. Thanks to an old veteran of forty years old and a tall, slim striker from Uruguay. Union San Felipe isn’t an old soccer club. It was founded in 1956, on October 16. San Felipe rapidly made headlines, and in 1961 their second place in the second division earned them promotion to the topflight. They did pretty good the next years (9th, 8th, 15th, 14th, 14th and 8th) until 1968. That year the Chilean First division was, for no good reason, divided into two groups. One with eight teams from Santiago, called Metropolitano. The other group consisted of ten teams from anywhere else, called Provincial. Of both groups, the top five got into the champions group, the other in the relegation group. Union San Felipe ended last in that last group and was relegated to the second division. The next year, the club only managed 6th place in a mediocre season. But then things changed for the better. 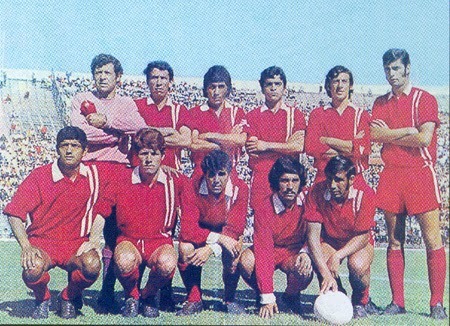 The 1970 season in the second division ended in triumph. First Union San Felipe claimed fourth place in the Northern Group (14 rounds) and qualified for the real league. With 36 points in 26 matches the club finished one point ahead of Iberia and was promoted back to the highest level. Of course, as a newby Union San Felipe wasn’t one of the favorites for the 1971 Chilean title. That would be Colo Colo (already 10 times champion of Chile), Universidad de Chile (six times champion, of which five times since 1962) and Union Espanola (two times champion in earlier days, 1943 and 1951). Somewhat surprisingly, the 1971 season did start well for Union San Felipe. Away at Santiago Wanderers on April 11, they claimed a point (1-1), with Graffigna scoring the goal. After that, Union San Felipe managed three more wins and one draw. So after five matches, Union San Felipe was top of the table with eight points, alongside Union Calera, Union Espanola, Deportivo Concepcion and La Serena. Colo Colo was on seven points, Universidad de Chile (3 points) had a poor start. In Round 6 San Felipe lost the big match at home against Union Calera (1-4), who a week later got smashed by Colo Colo at home (1-6). So by then it was clear that everybody could beat everybody, and it would be a close call to the end. Halfway through October, San Felipe had collected 29 points from 25 matches, just behind Universidad de Chile (31 points) and Colo Colo (33 points). With such experienced opponents, it wasn’t very likely that San Felipe was thinking of the title. This last victory against Lota Schwager was enough to clinch the title. Sixteen points from the last nine matches was outstanding, Colo Colo only managed eight points. In the end, Union San Felipe collected 46 points from 34 matches, Universidad de Chile 44, Union Espanola 42 and Colo Colo 41. Below is the squad, coached by Luis Santibanez, that provided Union San Felipe with their only Chilean championship so far. 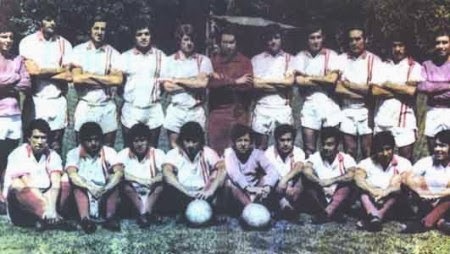 Santibanez later coached Union Espanola and won the Chilean title three more times (1973, 1975 and 1977). With Union San Felipe, Chile had a champion with good players, but without the really big stars. For example, no player was selected to travel with the Chilean team to the World Cup 1974 in West-Germany. It just all came together those two years. Still, there were a few players who made some extra headlines. * Manuel Gaete. Captain of this team, born in 1948. Left Union San Felipe in 1973. After a year at Magellanes, he followed coach Luis Santibanez to Union Espanola, and gained a second title in 1975. Played three matches for the Chilean national team, against Ecuador and Portugal in 1972, and against Argentina in late 1974. Gaete died young in 2003. * Marcelo Bellavigna. Experienced player from Argentina, new in this team from Nueva Chicago. Had a very promising start of his career in 1964 with Independiente, with whom he won the Copa Libertadores that year. During that campaign the defender only played the two matches against Alianza Lima, sitting on the bench during the semifinals and the finals against Santos and Nacional Montevideo. Bellavigna changed to Arsenal and then later Tigre, all clubs at the highest level in Argentina. Union San Felipe was his only foreign adventure. * Jaime Ramirez. With 46 caps (12 goals) for Chile, Jaime Ramirez was by far the most experienced player of Union San Felipe. He also took part at the World Cups of 1962 (6 matches, 2 goals) and 1966 (no matches). Ramirez played for twelve different clubs, in Chile, Spain (Espanyol and Granada among others) and Argentina (Racing Avellaneda). 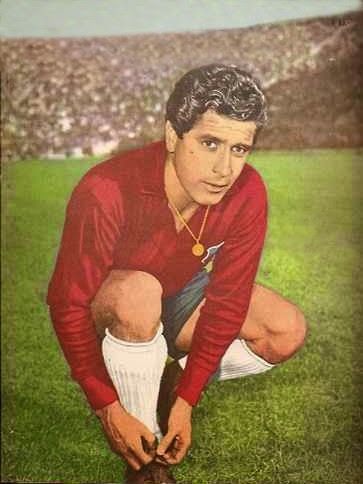 He had already been champion of Chile in 1956 (with Colo Colo) and 1962 (Universidad de Chile), when he started playing for Union San Felipe in 1971. Forty years old he still had a major contribution to the success of the team, with 13 matches and 1 goal. Ramirez, just like Gaete, died in 2003. * Gustavo Uruguay Graffigna. 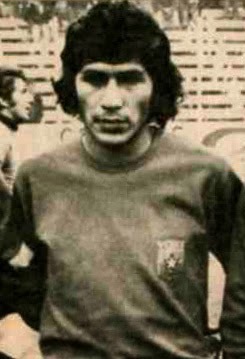 Striker from Uruguay (born 1948), who was instrumental in the last matches of the 1971 season. After the title, Graffigna started a big adventure that left him playing all over the world. After a year at Antofagasta, he moved to Mexico in 1972. First he had a fine year at Pachuca, then some unproductive months at Atletico Espanol. 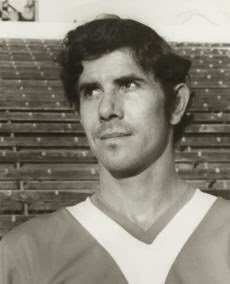 After that, for reasons unknown, Graffigna changed his name into Uri (derived from his second name Uruguay) Banhoffer and went playing for Los Angeles Aztecs. In his two NASL-years he did pretty good, scoring seven goals in 1974 and an amazing fourteen in 1975. After that, his career took a strange turn. He went for a European adventure at Dutch club PEC Zwolle. A club he certainly did not know, but of course the Netherlands were top of the bill in soccer those days. After changing his first name into Yuri (Uri sounded a bit to German, people in Zwolle thought), Banhoffer adapted pretty well to the Dutch conditions. As one of the first ever South American players in the Netherlands, he was very popular amongst the supporters. The biggest achievement of the club in those years was a place in the final of the Dutch cup, in 1977. Banhoffer opened the score in that match against FC Twente, but his header was disallowed. In the end FC Twente won, 0-3. After three years at second level (22 goals), PEC Zwolle finally gained promotion to the highest level. Banhoffer played 24 matches during the 1978-79 season, scoring three goals. After that, he decided to return to soccer in Chile (his wife was Chilean). He still lives in Valparaiso. One year after the big success, Union San Felipe escaped relegation by just two points, while a freewheeling Colo Colo won their eleventh title. Also, San Felipe’s adventure in the 1972 Copa Libertadores was unlucky. For starters they weren’t allowed to play in their own stadium and had to play in Santiago. Still, they got four points from their three home matches, but lost all their away games to Universidad de Chile and Peruvians Alianza Lima and Universitario. This all quickly ended the fairytale of Union San Felipe. Nowadays, Union San Felipe relegated from the top division in 2012, and is trying to come back this season.